Indexing, the process of putting data in a search engine, often is the foundation of anything when building a search based application. 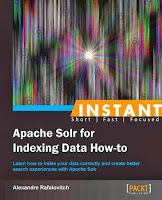 With Instant Apache Solr Indexing Data Howto Alexandre Rafalovitch has written a book dedicated to different aspects of indexing. The book is written in a cookbook style with tasks that are solved using different features of Apache Solr. Each task is classified with a difficulty level (simple, intermediate, advanced). The book shows you how to work with collections, index text and binary content (using http and Java) and how to use the Data Import Handler. You will learn about the difference between soft and hard commits, how the UpdateRequestProcessor works (showing the useful ScriptUpdateProcessor) and the functionality of atomic updates. The final task describes an approach to index content in multiple languages. Though it is quite short the book contains some really useful information. 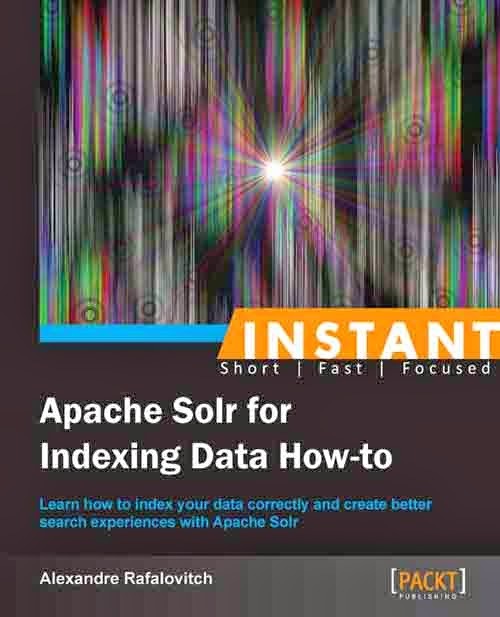 As it is dedicated to indexing alone you can't really use it for learning how to work with all aspects of Apache Solr but you can get some bang for the buck for you daily work. The only thing that I missed in the book is a more detailed description of more filters and tokenizers. Nevertheless you get quite some value from the book for a reasonable price.